It has been a few months since I posted a craft/art project my son (whose 5 1/2) and I have worked on together. The objective of this project was to complete the homework assignment for the 100th day in Kindergarten (due Tuesday 12th Feb). Sean has been collecting beer bottle tops for a while now. He counted out 100 tops (all on his own). After collecting the items they will decide how they will display them. Your child should bring their project to school to share with the class. I think Sean did a great job, don’t you think so !! Surprisingly enough, Sean stuck on most of the beer bottle tops and with supervision we spray painted the bottle, once dried he stuck on the stickers. As parents, we cut the shapes of the wings and the bottle, so the wings hold, with a blade and then used rivets to hold the wings in place. 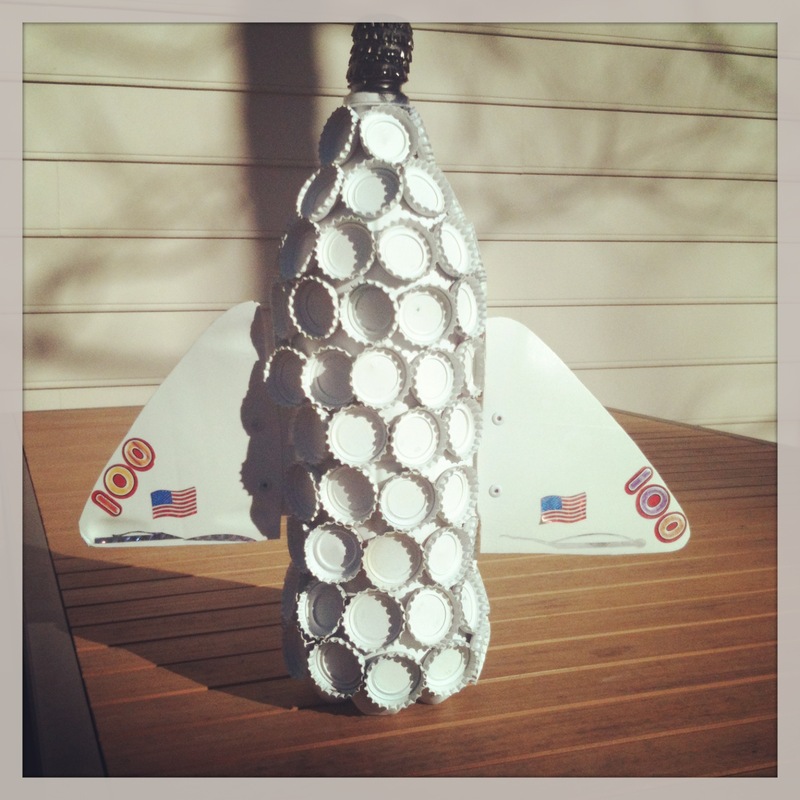 This entry was posted in Uncategorized and tagged 100th day, art, arts, aviation, beer bottle caps, beer bottle tops, children, craft, craft glue, crafts, diy, glue dots, homework assignment, kids, kindergarten, laundry detergent, plastic bottles, project, recycled materials, rivets, space, spaceship, transportation on February 9, 2013 by mlwilkie. Very impressive work Sean!! Congratulations on 100 days of kindergarten! Sean says ” Thank you”. He was excited about his first comment :-). What a fabulous job Sean did, it looks great!! My son (almost 5) would love this – he is so into space! !